Award-winning writer Van Jansen (The Flash, Green Lantern), and artist Dennis Calero (X-Factor) have been selected as the creative team to bring the very first James Bond novel, Casino Royale, to the pages of comics for the first time in the series' history. Set for release in October, the 160-page graphic novel will transport 007 fans back to the 1950's with its stylish artwork and classic story! Ian Fleming's literary debut of British Secret Service agent 007 is stylishly adapted to the sequential art medium by Van Jensen and Dennis Calero in the official James Bond: Casino Royale graphic novel. Sent to a French casino in Royale-les-Eaux, Bond aims to eliminate the threat of the deadly Le Chiffre by bankrupting the ruthless SMERSH operative at the baccarat table. However, when the luck of the draw favors his enemy, 007 becomes the target of assassins and torturers in a high-stakes game of cat-and-mouse. A former crime reporter and magazine editor, Van Jensen is the author of the critically acclaimed graphic novels Pinocchio, Vampire Slayer and The Leg. He has also written such series as Green Lantern Corps, The Six Million Dollar Man, and The Flash. "When we first announced Warren Ellis' breakout original James Bond series, we teased that this would only be the beginning of our relationship with the character and the Fleming family, who have been very generous," says Dynamite CEO and Publisher, Nick Barrucci. "It's incredibly rewarding as it's the treasured story that any publisher would wish to add to their library. We have been very fortunate to be granted the rights to do so. Combining Van Jensen's storytelling talent with Dennis Calero's stylistic artwork, the Casino Royale graphic novel will stand out to fans for years to come." 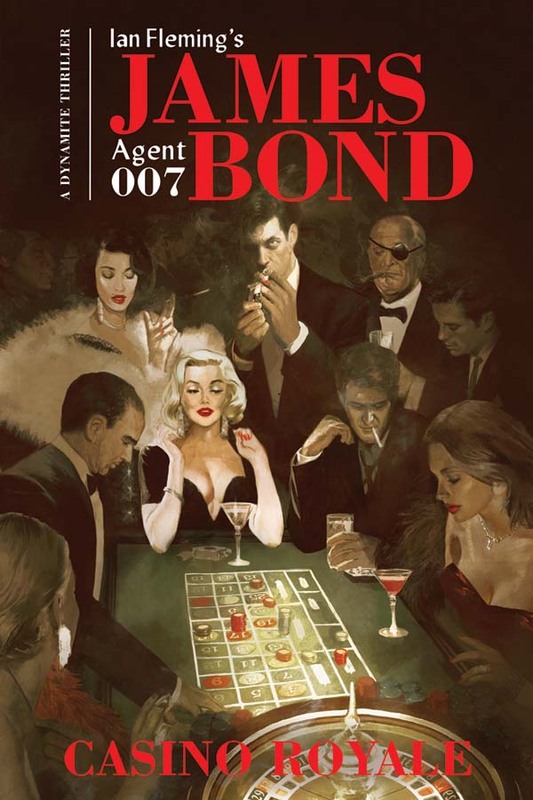 In 2014, Dynamite Entertainment made headlines across the comics industry and beyond with the news that the New Jersey publisher had secured the license from Ian Fleming Publications Ltd to produce the first James Bond comics in 20 years. The first series, written by Transmetropolitan writer Warren Ellis, launched the following year to widespread critical acclaim, and was a breakout success in the comics specialty market. Subsequent James Bond story lines include Diggle and Casalanguida's Hammerhead and Kill Chain, James Robinson and Aaron Campbell's Felix Leiter, Benjamin Percy and Rapha Lobosco's Black Box, and Kieron Gillen and Antonio Fuso's Service Special. James Bond: Casino Royale will be solicited in Diamond Comic Distributors' July 2017 Previews catalog, the premier source of merchandise for the comic book specialty market, and slated for release in October. Comic book fans are encouraged to reserve copies of James Bond: Casino Royale with their local comic book retailers. James Bond: Casino Royale will also be available for individual customer purchase through digital platforms courtesy of Comixology, Kindle, iBooks, Google Play, Dynamite Digital, iVerse, Madefire, and Dark Horse Digital.